Photo courtesy of Cupertino Chamber of Commerce Facebook page. The Cupertino Chamber of Commerce on Friday will recognize members of the business community who have done great work to strengthen the city’s diversity. 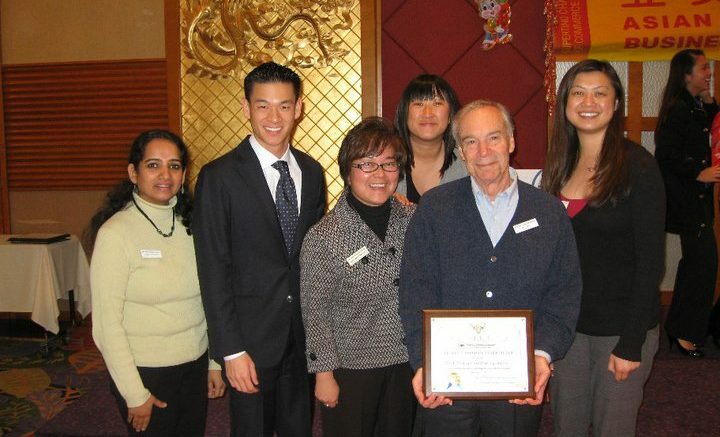 The Chamber’s Bridge Award “recognizes those individuals and organizations that have helped build trust, respect and dialogue within Cupertino’s multi-ethnic and multi-cultural business community,” according to the Chamber. The awards will be presented at the Lunar New Year Luncheon on Feb. 8. Recipients this year include: Barbara Nunes for Individual Service; Kiddie Academy for Outstanding Business of the Year; and Feathers in the Wind for Organization of the Year. According to the Chamber, Nunes is being recognized for her time as a high school principal, her work with Quota International and her stints on the West Valley Community Service Board and Fremont Union High School Board of Education. “Barbara has served as a catalyst to promote dialogue and innovation across organizations and cultural groups in Cupertino,” the Chamber said in a press statement. Kiddie Academy is receiving recognition for delivering a decade’s worth of education and school preparation to children. Feathers in the Wind is a volunteer dance team that has “performed traditional and modern Chinese dance routines at events for free throughout the community and region for over 10 years,” according to the Chamber. For more information, visit www.cupertino-chamber.org. Be the first to comment on "Bridge Award recipients to be recognized on Friday"